Add fabulous to any room with REV curtains by LJ Home Fashions. Neutral colors and a vintage design that will compliment any contemporary, modern or traditionally styled decor. Tone on tone shag stripe available in THREE (3) colors - greige (beige ivory mix), cream ivory and dark grey. Vintage shag stripe inspired by the iconic 1960's. Fabric has slight shimmer and textured ground. 100% polyester. Set includes TWO (2) grommet top curtains. EACH panel is 52 inchW x 95 inchL. 1.6 inch grommet diameter. All dimensions are in inches. Fabric is light filtering. Curtains can be combined with a blackout treatment (roller shade, solar shade etc) to maximize your room darkness. Easy to install. Grommets fit standard sized curtain rods. Please note, LJ Home Fashions cannot be held responsible for color variations between the product and images seen on your computer/tablet/phone screen. This classic voile can enhance any other drapery or can be hung and bring elegance to your environment by itself. 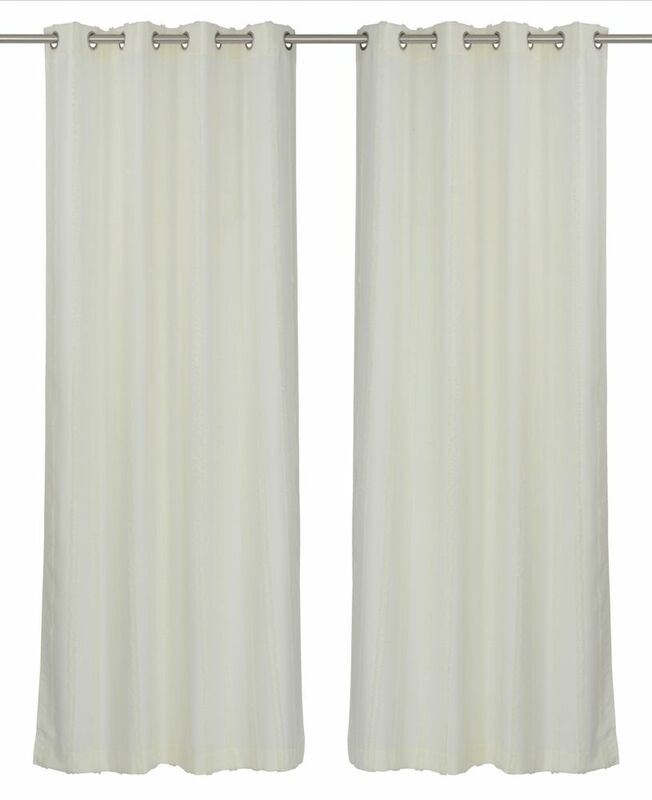 Hathaway is a lovely tailored rod pocket curtain panel with a scalloped hem and an embroidered scroll motif, color white. Panel measures 54 inches in width and 63 inches in length. Kazan is a light filtering washed cotton curtain panel with a decorative rope top header, in colour cream. Panel measures 50 inches in width and 95 inches in length. Rockport is a pair of all over printed rod pocket curtain panels that come with a pair of matching tie backs, in color linen. Panels measure 100inches in width and 84 inches in length. REV Shag Stripe Privacy Grommet Curtain Panel Set, 52 inch W x 95 inch L, Cream Ivory Add fabulous to any room with REV curtains by LJ Home Fashions. Neutral colors and a vintage design that will compliment any contemporary, modern or traditionally styled decor.